Each of the 30 chapters tackles a question from letters sent to Chittister by her readers: Where is God? What does it mean to be a spiritual person? What’s wrong with me—why can’t I change? 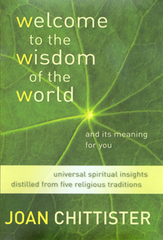 Deftly shows how each of the five major religious traditions brings a special gift to the art of living a good life. Ecumenical readers will find a God who is acutely aware of human suffering and longing and helps us in surprising and meaningful ways.